Night time can be a difficult when you have a baby with eczema and sleep is constantly interrupted by itchy inflammed skin. Sleep can often be disturbed which can affect you and your baby. There are the short term issues, which may include your baby being tired and irritable. But just as important are the longer term effects that a lack of sleep can have on your baby. Sleep is important for a growing baby. It helps with brain development and concentration. It also boosts their immune system, which helps their eczema to heal. The times given total the amount of daytime naps and overnight sleep. As there is a link between eczema and sleep, or the lack of, where your baby sleeps is very important. The room needs to be kept cool. This could mean keeping a window open as much as possible. Or in the winter putting the central heating on as low as possible. A dry hot room can cause their eczema to itch, which will disturb their sleep, and scratching will make the symptoms worse. Your baby will spend a lot of time in their cot or bed. It is recommended that a new mattress is used from the time they are born. An older mattress may contain dust mites, mould or anything else that has soaked into it. Once you have a new mattress, you can use a mattress protector. These can help reduce the effect of dust mites, and stop anything soaking into it. The bedding you use is also important. Bedding made of 100% cotton, and free of dyes is the best choice. Another option is anti-allergy bedding, although this tends to be a little more expensive than the plain cotton option. It is advised that bedding is washed before it is used. There may be a trace of the chemicals used by manufacturers left on it. Its best to use a laundry detergent made for sensitive skin, or a natural laundry detergent. In many bedrooms you’re likely to find at least one soft cuddly toy. Try to keep these to a minimum. Not only can the fur make your little one's skin hot and itchy, they also collect a lot of dust. This dust spreads and also encourages dust mites. Having a good routine at bedtime can help stop sleepless nights. 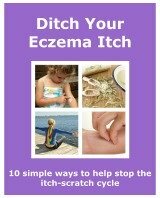 This is even more important when your baby has eczema and sleep is sometimes a rarity! Get them relaxed ready for bed. This may include stroking their hair or giving them a cuddle, though be aware of making them too hot. You could also read them a story, or put on some calming music. Anything goes, as long as it isn't too stimulating! Put your baby to bed when they are getting very tired. If they aren't tired they'll be more likely to scratch. When they are tired they'll also start settling themselves to sleep. A baby can be taught to settle themselves to sleep. They can do this at bedtime, and also when they wake up in the night. It can help them get into a routine and also means that you won't be constantly up and down the stairs each time they wake! When they first go to sleep at night place them in their crib or cot. Keep the lights dimmed as much as possible. I read a tip on Netmums.com advising that you can put something in the crib that smells of you, as it can soothe them. If they wake up at any time leave them for a couple of minutes to see if they fall back to sleep themselves. I'm sure as a parent of an eczema sufferer you'll be tempted to go and make sure they aren't scratching, or are in any way distressed. One way around this is to use a video baby monitor. You'll be able to check on your little one without entering their room, which may cause them to wake up further. If they are scratching, and especially if they are distressed, then definitely go and see them. They may just need a bit of reassurance. Also apply some more emollient. You can keep it in the fridge. The cold cream will help to cool your baby's skin down. You can also apply any other treatment that has been prescribed by your doctor, like topical steroids. You could also try using scratch mittens. As the name suggests, they are worn on the hands and your baby will find it very difficult to remove them. They will make it extremely hard for them to scratch! One thing that I'd recommend you don't do, is to allow your baby to share your bed. Your bed will be a lot warmer than a baby crib, which will just make the itching worse. It could also become a bad habit and will make it harder for your baby to settle themselves. I understand that getting any baby to sleep can some nights be extremely hard work, but when your child has eczema it makes it a whole lot harder! If you have any tips you use that make eczema and sleep benefit each other I'd love to hear them, and I'll share them so they can help others.